Quality isn’t just our name; it’s what you can expect! Quality Body Works, Inc realizes that no matter how good your car looks, when it comes out of our shop, first impressions going in are always important. Our customer waiting area is a comfortable, friendly and clean place for you to visit. Cleanliness is the one thing you’ll notice about Quality Body Works. There’s no dust in the air from sanding, no bad paint smells, no dirt. Quality Body Works Inc has ICAR trained technicians dedicated to ensuring that we get the best parts available for your repair. We’ll find the right Original Equipment Manufacture (OEM) or the best aftermarket parts to ensure that your vehicle is repaired to OEM standards. Your safety and our reputation demand it. When we first saw the highly sophisticated Genesis Computerized Electronic Measuring System, we knew we had to have it. This machine is incredibly accurate because it uses the same laser technology used by car manufacturers to ensure correct frame alignment. Our technicians mount laser targets at certain points on the vehicle body which monitor the structure in real time. Then our technicians consult the data from the Genesis Computer. 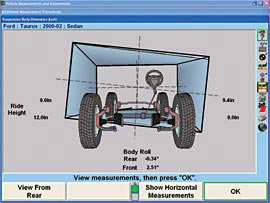 It contains all the manufacturers’ specs for the vehicle dimensions, and then he aligns the car to its pre-accident condition. We’re sticklers for matching the paint to your vehicle. 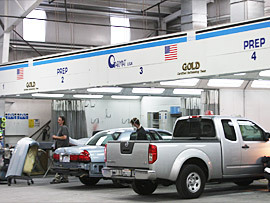 Our paint technicians use the Sikkens Automotive Finishes computerized paint mixing system to ensure we get the best color match on your vehicle. It doesn’t matter whether you’ve got a new vehicle or one that has been on the road for a while; we can match it so that the repair area is not visible to you or anyone that sees your vehicle. 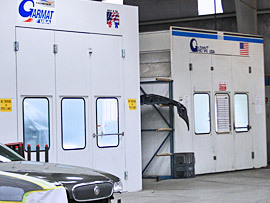 We us a state of the art Garmat downdraft paint booth that features a special filtration grid in the floor that contributes to a cleaner environment by trapping the paint overspray, when your vehicle is painted, and recycles 80% of the heated air during the bake cycle. We recycle about 95% of all our paint waste. We gather it up, distill it on site and reuse it in our paint gun washer. 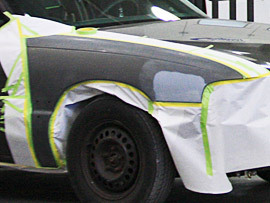 We use the most durable automotive paint in the industry — Sikkens Automotive Finishes. This is your guarantee that your vehicle has been worked on only by highly trained and certified technicians. It also means your vehicle is returned to you with a limited lifetime guarantee on its new finish. 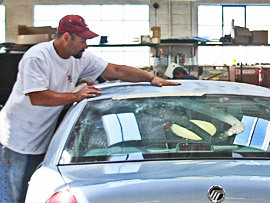 After your vehicle is repaired, you’ll want to maintain its good look. Here are a few paint care tips that will help! Protect your vehicle from the elements, tree sap and bird droppings. Do not park under a tree and if possible, keep your vehicle in a garage or carport for added protection. Rinse off any bird droppings, tree sap, road residue and other liquids as soon as possible. You can wash your car any time. When you do, use only fresh water and automotive-type soap. Avoid direct sunlight and wash in a shady place. Also avoid high pressure and commercial car washes for at least 30 days as they can damage your paint’s finish. Use a commercial car wash after 30 days, being cautious of high pressure hoses and hard brushes as they can damage your car’s finish. We recommend that you wait 30 days after painting to wax your car.